Long time, no blog. Might’ve called this the Winter of my Discontent, but I don’t really want to get into the details of the past few months. 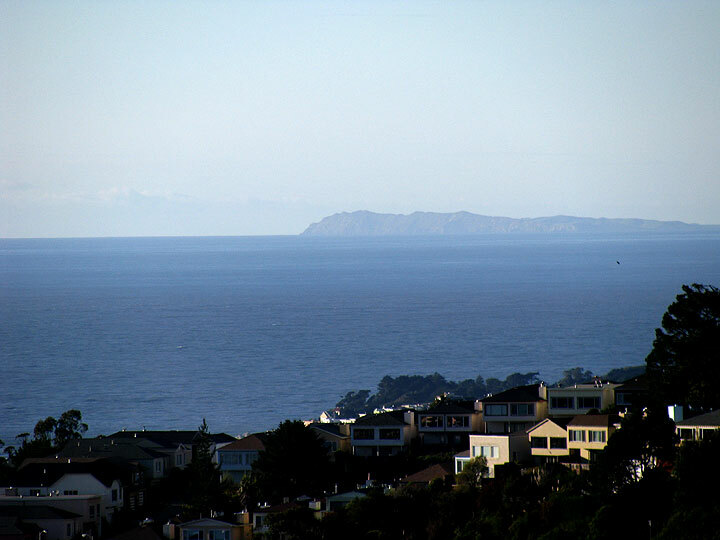 Housing and income dramas are underway, with no particular end in sight, while various political and social groupings left me feeling isolated and disappointed. So it goes. And I just haven’t felt like writing. 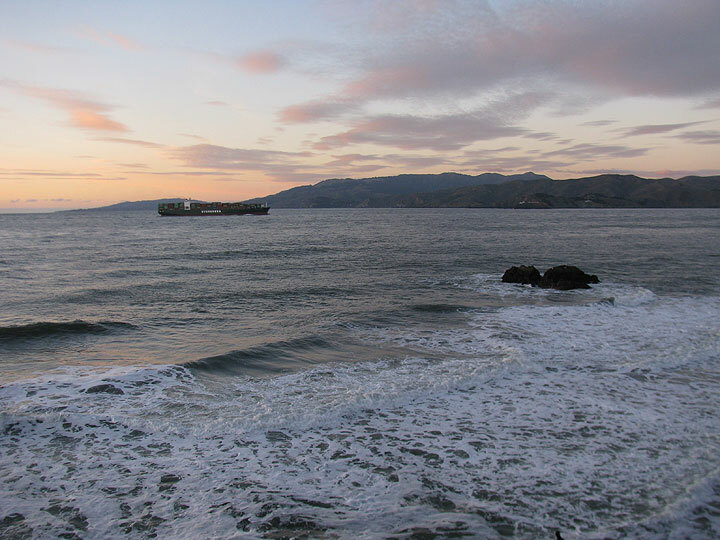 Photos in this post not related to what I’m writing about, but kind of a parallel story of high tides and beautiful winter light. Early January view north from Twin Peaks (south). 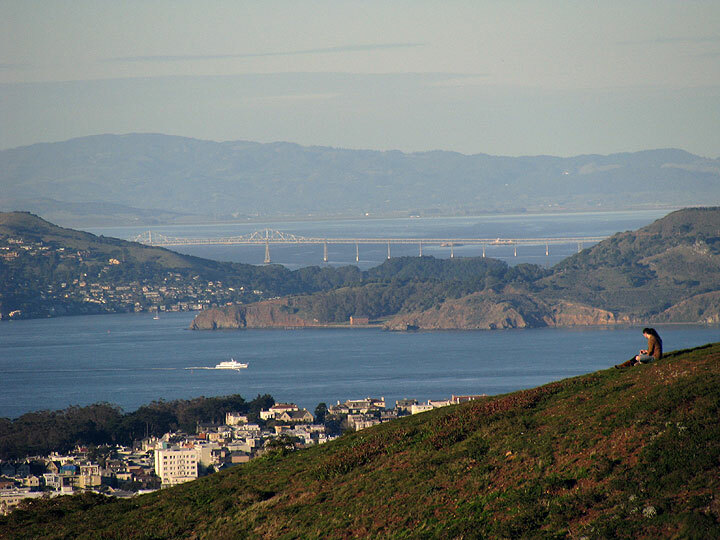 San Rafael bridge visible across the edge of Angel Island. I find myself staying up and getting up late (it was really bad during the holidaze), reading a lot, staying home instead of going out, reducing my internet time though not as much as I ought to. Never fails to amaze me how much time I can waste noodling around the internet, reading posts, news, catching up on this and that. I’m going to come back to this in a later post, but one cluster of books I read recently included Geert Lovink’s Networks Without a Cause which informed me that no one reads blogs, or if there are some readers, certainly no one comments on them (that has long been my experience—stats indicate that there are usually about 1000 visitors a month, but how many are real people? How many read anything through? And comments? Less than a dozen per year of non-spam, actual thoughtful commentaries.) I’ve always understood this blog, and my writing in general, to be in service to what I want to say. I don’t write for an audience. I appreciate it when people get something out of what I write, but I have never written FOR an audience, but for myself. 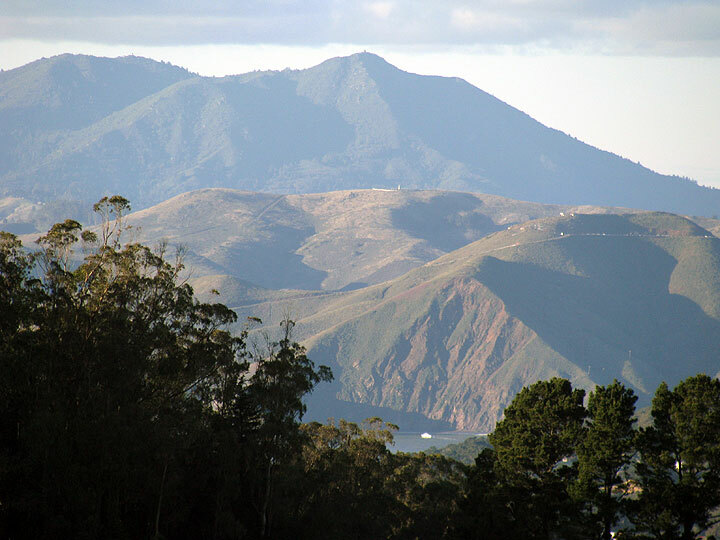 Surprising that a view like this is possible from the same spot on Twin Peaks. Anyway, I just started teaching 19th century San Francisco history at the SF Art Institute again, and decided I needed to get better informed about the first half of the 19th century that preceded the founding of San Francisco or the acquisition of California by the U.S. Some months ago I read about Andrew Jackson and his Indian Wars against the large cultures of the southeast (Creek, Cherokee, Seminole, Chocktaw, Chickasaw), pushing them west across the Mississippi during his Presidential reign 1828-1836. Even earlier than that I read about the Comanches and the empire they anchored in the southern Great Plains from the mid-18th century to after the Civil War, a story that is left out of most histories. Due to the severe pressure of Comanche raids on Texas, Mexico liberalized immigration to the territory, leading to an influx of Americans who became the majority of the population by the early 1830s. The Texans gained their independence from Mexico in 1836 and were an independent country for about nine years before annexation to the United States in 1845. But those years of independence involved huge debts incurred to British and U.S. banks, a floundering economy, and a persistent claim by Mexico that Texas was still part of it, while at the same time the Comanches continued their dominating economic role of raiding and trading all around and in Texan territory, making economic development along capitalist or even just large agrarian lines nearly impossible. Amy Greenberg’s excellent history “A Wicked War: Polk, Clay, Lincoln, and the 1846 U.S. Invasion of Mexico” helped me grasp a lot of the missing pieces politically of the decade and a half before the beginning the city of San Francisco. Perhaps the most remarkable single item I learned was how the U.S. started the Mexican-American War. I had assumed it had to do with the gold discovery in California and that there had been some kind of pretext to allow the U.S. to attack. But I hadn’t realized that the pattern established in 1846 became the DNA of U.S. military expansionism and is still being followed to this day. 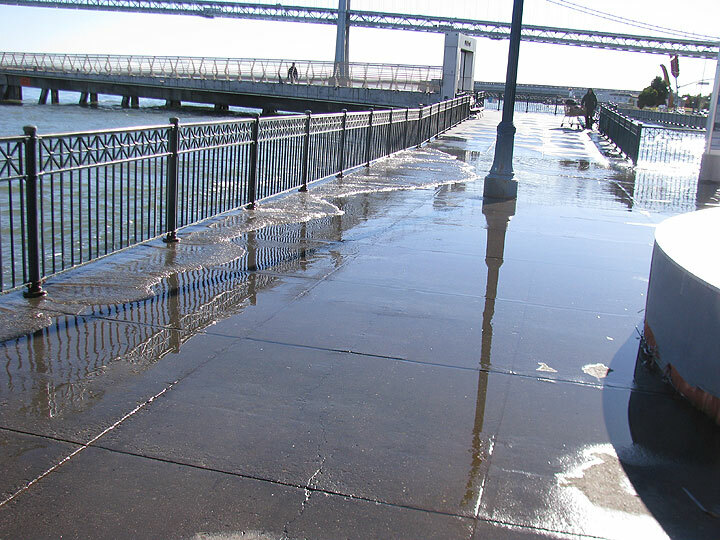 California King Tide in January led to coastal flooding, a sign of things to come! Democrat James Polk (an Andrew Jackson protégé) won the 1844 presidential election, first getting the nomination over the presumed Democratic nominee, former president Martin Van Buren, and then much to the entire country’s surprise, defeating the longtime national political figure Henry Clay, the candidate of the Whig Party. The Whigs lost in Pennsylvania and New York, the latter by only 5,000 votes, in a state where 16,000 abolitionist votes were cast for the Liberty Party. Had a third of those votes gone to Clay, he might have won, and if he’d won, it’s unlikely the annexation of Texas would have proceeded, nor the ensuing invasion and war with Mexico. Polk, as Greenberg’s account makes clear, was set on taking California from Mexico before he came into office, long before the discovery of gold. He was a committed partisan of Jacksonian expansionism and a pro-slavery Democrat. 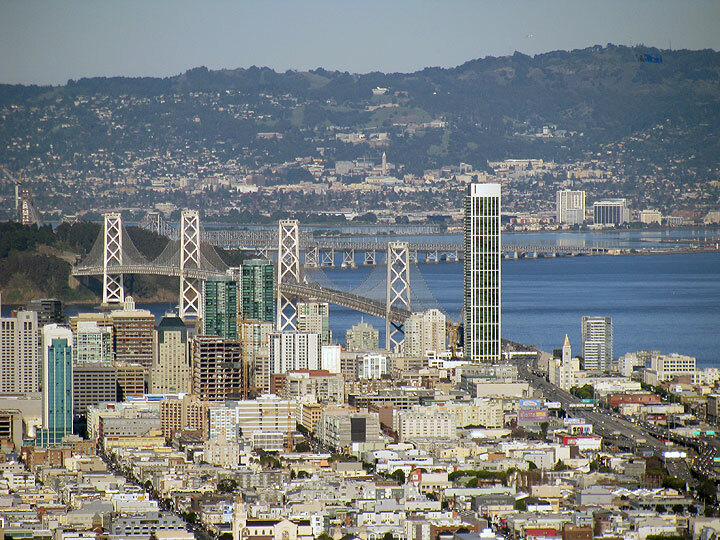 San Francisco bay was the coveted target, but so were the rich lands of California, and access to the wide Pacific rim markets too. No doubt the need for expanded territories for slavery played in his agenda as well. 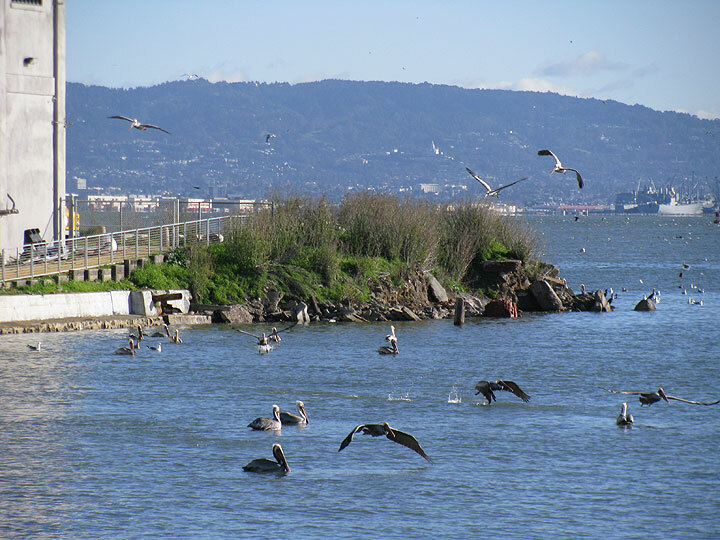 A big herring run during the King Tide led to a wild bird feeding frenzy along the bayshore, here at Warm Water Cove off 24th Street. Soon after Polk’s election, but before his inauguration in March 1845, the U.S. Senate ratified the annexation of Texas agreement that had been presented by outgoing party-less President Tyler (who had served most of the four-year term for William Henry Harrison, a Whig general who died of pneumonia a month into his term), Polk ordered General Zachary Taylor to march his army into Texas, ostensibly to protect it from possible attack from Mexico. He also ordered the Navy to get ready off the coast of Mexico and California for possible hostilities. Taylor was sent not to the recognized southern border of Texas at the Nueces River (today’s Corpus Christi), but another hundred miles south across the disputed “Nueces Strip” to the Rio Grande in what was recognized by everyone as Mexico (except for some Texan expansionists). After Taylor’s army set up camp across the Rio Grande from Matamoros, Mexican forces began to gather. A Colonel Hitchcock in Taylor’s army wrote in his diary: “We have not one particle of right to be here… It looks as if the government sent a small force on purpose to bring on a war, so as to have a pretext for taking California and as much of this country as it chooses.” Dozens of American soldiers deserted to the Mexican side, including some who later fought in the storied San Patricio Battalion (mostly Irish immigrants). When a Mexican cavalry patrol crossed the Rio Grande they were met by a detachment of U.S. soldiers. The Mexicans captured them and killed 11 in the skirmish. This became the event that Polk had been waiting for. He had been composing his declaration of war for weeks, and now he declared to the Congress that “Mexico has passed the boundary of the United States, has invaded our territory and shed American blood upon the American soil”—a bald-faced lie. 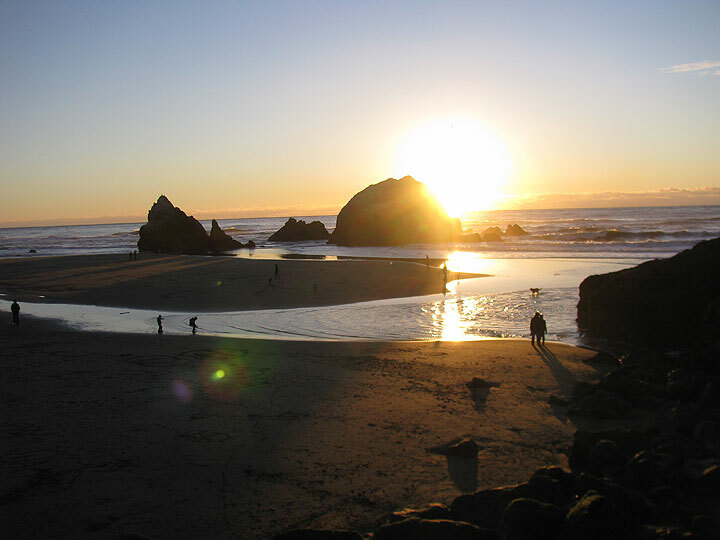 Seal Rock at low tide during January sunset. So the war began and it went badly for Mexico, which was politically in disarray, economically dysfunctional, and militarily quite weak. A good account from the Mexican point of view which I also read is “A Glorious Defeat: Mexico and Its War with the United States” by Timothy J. Henderson. I won’t try to explain the crazy, Byzantine power struggles among the Mexican elite that tended to revolve around the disgrace and rehabilitation of Santa Anna, who served as President of Mexico on 11 separate occasions. The U.S. army under Winfield Scott managed to occupy Mexico City, but during those months of occupation a steady guerrilla war was carried on by Mexican partisans. Meanwhile, the U.S. forces that invaded from the north under Taylor, as well as Scott’s troops, became famous for rapes, murders, and atrocities wherever they were, another way we can see the DNA of U.S. militarism being well established before the middle of the 19th century. The wars against various Indian civilizations, of course, were of much the same nature. White settlers invade their lands, and then claim they’ve been wronged when Indians fight back. Later, the model is repeated in the Philippines in 1898, when Admiral Dewey cuts a deal with the Spanish to take Manila harbor after some hours of shelling, and then weeks later, when a vote is imminent in the U.S. Senate to annex the Philippines (and does not have enough support to pass), a U.S. patrol is sent over a bridge that separated U.S. troops from Philippine nationalist fighters. Shots are exchanged, and a cable arrives in Washington DC the night before the vote claiming that the U.S. has been brazenly attacked. The ensuing hysteria and patriotic frenzy switches just enough votes to get a bare majority for annexing the Philippines, which remains a U.S. property until after WWII. And in the same way that vets bring the trauma and violence home with them from Vietnam, Iraq, etc., some of the volunteers who fought in the Mexican-American war came to California and carried out a genocidal slaughter against California Indians, and later attacked Chinese, Chileans, Mexicans, and others with impunity. One group of New York volunteers who set out with their commander to California but never saw any actual action in the war became a predatory gang known as the Hounds in San Francisco’s first year. 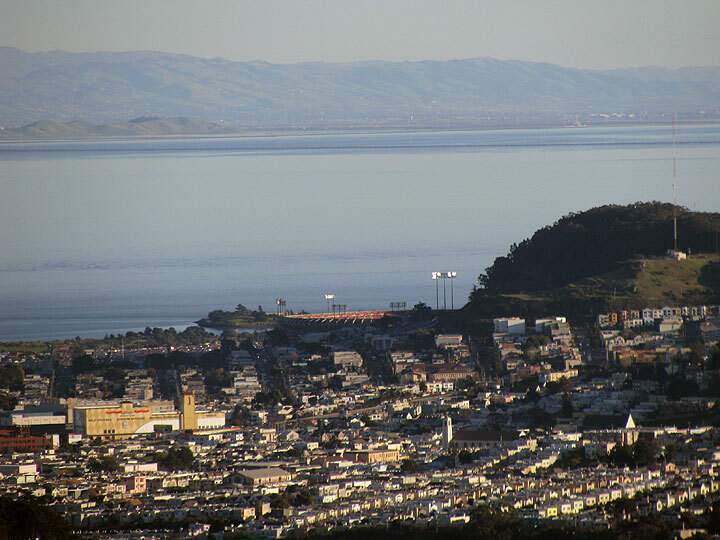 Candlestick Park (to be demolished in two years), and in the distance the Coyote Hills park on the southern east shore of the Bay. Pt. Reyes from Twin Peaks ring road... far to the north on a crispy January afternoon. I’ll have to let you know later about “The Middle Ground,” I haven’t finished it yet…. got distracted after the first 50 pages and read several other books since… but I’ll get back to it soon. I really enjoyed this post, and the photos are awesome. How did you like the book “The Middle Ground”? Enjoyable post as usual. I’m not sure why you started off with the stuff about “Networks without a Cause,” as it sounds like a contentious point. What does that mean that no one reads blogs? Sounds like a tendentious definition of both “no one” and “blogs.” Facebook, which is essentially a platform for blogging one’s life and thoughts, is the most-visited website on the planet. As far as the reasons for writing and posting on the Internet, there are many, but I basically do it when I feel like I have something to say or share that other people haven’t said or shared in the same way. As it happens, I’ve also gotten some work offers based on my online writing. If one of your goals is to cast a net for work, it never hurts to have bigshots promote your writing for you — I know you are in tight with a lot of reasonably famous writers who would probably send readers your way if you were to ask for it. If you want more comments, ask for them. One issue is that your posts are generally so long and involved that it seems inappropriate to try to reply in a typical blog comment — if I am going to sit down to write something good, I’m unlikely to do so in this little box. Which explains a bit of why Gawker gets many comments, and Nowtopian doesn’t. What she also emphasizes is the amount of anti-war sentiment, for good and bad reasons, that quickly developed. I was impressed by her breadth of knowledge of all the factors relating to the war. Not the usual myopic history lesson. Great photos, affecting notes in the post – it’s says something about my own own intellectual futility that I sneaked many a look at your blog – the political writing is always incisive, the narrator reliable, which is very, very hard for me to find on the big web. I agree that no one should write for anything but his or her own stimulation ( one excellent aggregator of all things craptastic in this political culture is forever whinging about “traffic,” being querulous in comments, and so forth), but a little appreciation from the wider world is certainly not to be disdained. There’s no money in blogging, and a lot of work with often little reward, but these parlous political times demand a critic, one who has been been versed in vritually all the left wars, and you’ve got the goods. if you post a note on FB every time you have a new blog post/article, it’s pretty sure many people are going to read the piece – as you certainly know. I found your digressions on the history of the US highly interesting; to the point that makes me feel sad for the fact that it’s pretty impossible to share such things on English-speaking (cycling) discussion boards – you get instantly bashed, specially as a non US citizen, just for mentioning these issues, no matter how adequate/polite you do it. I’d like to mention I got my copy of the Critical Mass book and found it terrific – it was particularly touching to read Marcelo Kalil’s account of the Porto Alegre story. Funnily enough (re: your mention of the Spanish American war) a Krag rifle which first gained favor as the weapon of choice for the invading US Army in the Philippines, is being brought into my house tonight (minus the bullets…I’m not that kind of gun owner.) It was issued to my Great Uncle James Creely, during WWI. Jay think this is a horrible gun, due to its part in the Spanish American war. Happy to read your posts again.